A little aside this one; something very, very cool that I’ve noticed with the advent of Visual Studio Update 2. 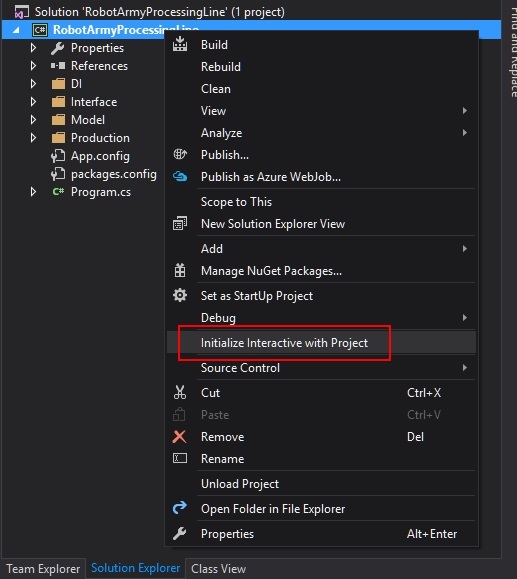 Without question, this rates as a MUST CHECK OUT Visual Studio feature. The first complaint (and a valid one, no question about it) in regards to the C# Interactive Window was that running your own code was a little bit of a painstaking process, requiring you to load dlls and supporting references manually, using the #r command. 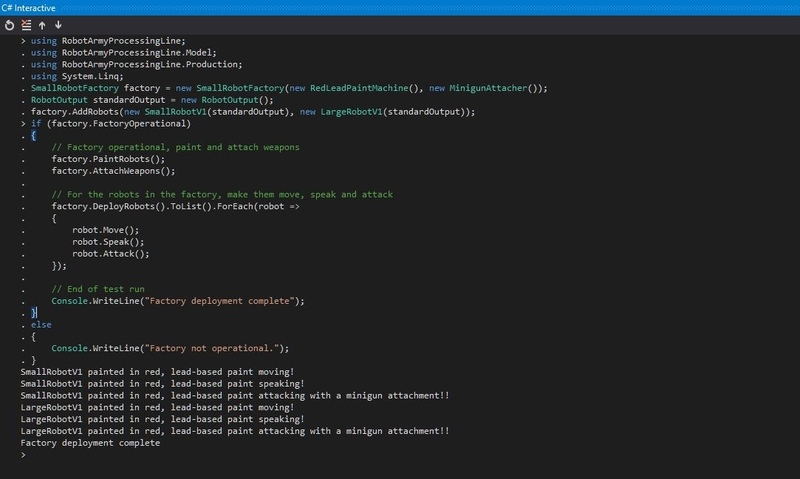 Now, with update 2, initialising C# Interactive with your applications context is a cinch. Initialise Interactive with Project Option. C# Interactive Window Initialised with Project. Using Project Code from C# Interactive. I did try this on a larger, more complex and tightly-coupled code base and I can comfortably say you’ll have issues depending on how things are structured. Smaller, more loosely-coupled types, where SOLID principals have been adhered to are going to allow you to use C# Interactive in this way with more ease. It is also possible to highlight portions of code, in any file, and right-click the Execute in Interactive option to run with, and execute, smaller chunks of functionality. Posts on the way to cover some elements of the ASP.NET Web API and Ninject Dependency Injection (hopefully, at some point over the weekend), so watch this space.